It's the between-holiday break, where you can slow things down a bit, get a little work done, otherwise have a fairly pleasant time. Stubless: The Sherlock special on New Yer's Day. Sunday, as you can see, didn't take me far, but it was what you can call a pretty good day at the movies: Start off with the highly entertaining The Big Short, take a break to go home and check your email, then head back in for a gorgeous 70mm presentation of The Hateful Eight, roadshow edition. I'd heard to perhaps give Dave a couple of days to work out any issues with the print, which worked out fine with my Christmas travel plans anyway, although I bet it was pretty darn spiffy on opening night anyway. Folks, you owe yourselves a chance to see the movie like this if it's playing near you (here in the Boston area, we are fortunate to have multiple options). I've heard people say the digital screenings look great, and I don't doubt it; they are being made from a 65mm source and that extra quality to start with can't hurt, but on large-format film, the colors (including blacks) are amazing, there is no pixilation even at a scale the brain only notices unconsciously, and a level of fine detail everywhere, with apparently very little compromise. The credits mention a digital intermediate, and I wonder what resolution that was at; it's got to be higher than the 2K or 4K that I suspect is typical given the typical source material and exhibition format. People I like a lot have praised the DCPs their theaters showed, and without disrespecting them, I think we have in many cases lost track of how good film looks. Even here, where we get a lot of repertory material in 35mm, it's separate enough from the new releases that I often don't compare the two mentally, so when we do get an actual physical print, it's kind of astonishing: Just look at how amazing even Black Mass, where the Somerville Theatre got one of about ten 35mm prints in the country, looks relative to the things showing next door. It's a thing I think we lose track of because we often don't have a lot of context in short-term memory, or because those arguing for film often focus on its artisanal qualities and comfortable imperfections compared to digital's reliable predictability without giving proper credit to how well-treated film lacks the compromise we take for granted with digital projection. We've reluctantly accepted "pretty good" so that studios and exhibitors can save money, especially where they were already cutting corners enough that steadiness was an improvement. Anyway, here's hoping that the places which embraced showing this on film do very well by it. There have been stories about theater managers apologizing for the overture/intermission and feeling relief when they screwed tons up enough to have to go to a DCP backup, which I guess helps differentiate between the people managing theaters because they like movies and those doing so because they're good at selling candy; hopefully the former can go to studios with numbers in hand saying their audiences like film and giving them an actual print will pay off for everybody. That said: I suspect that digital distribution has really helped with day-and-date releases. Maybe you get something like Bjirao Mastani, which I saw Tuesday night and was kind of on the fence about (looks great, kind of about rotten people), as Indian movies have been playing under the radar for decades, but who knows? Then, on New Year's Eve, after getting shut out of the 4:30pm show at the Brattle, I headed downtown, walked around the waterfront looking for ice sculptures. Just found the one at the Aquarium, which was actually kind of hard to see, being right next to the grey & silver Imax theater. But, that killed some time before the start of Devil and Angel, which is silly but occasionally effective. Fortunately, there was still time to get back to the Brattle for Casablanca, and for all the love of film I had up there... We had some issues; one projector broke down during the last reel, meaning the sound cut out completely for some of the classic lines and the audience got restless - insert standard rant about how yelling "sound!" or "focus!" is just about making oneself look concerned - but here's the thing: It got fixed. Sure, it was in part because the Brattle has dual projectors so they can do switchovers, but I'm betting that, by the Marx Brothers marathon the next day, they were able to get things going again, because you can fix mechanical things with a screwdriver. If the digital projector broke down, they'd have been screwed. At any rate, a fantastic print which still wrapped up just in time to get everybody doing what they do for the new year. Which, in my case, would be lazing around for the rest of the week and actually getting a fair amount of my apartment put away. Anyone asking if it was painless enough that I could have done it back during the summer - shut up. Still left me with time to catch the new Sherlock special, and man, has that gone downhill. It would be interesting if The Big Short, as surpassing entertaining film about the folks who saw the economic crisis coming, winds up one of the main rivals to Spotlight as awards season goes on. While they're both thoroughly entertaining movies based upon recent events, the knock on Spotlight has been that it is pretty straightlaced - I've heard the photography called boring a lot - while The Big Short is a lot looser, with fourth-wall-breaking asides, colorful characters, and a slightly jittery personality. The author's hand is more visible. It's fun, though, in part because director Adam McKay, known mostly for his comedies, has opted to make a funny movie that is not a comedy - indeed, there's a sense that if Mark Baum (Steve Carell) were not real, McKay would have to invent someone like him just to serve as a way to vent the anger that may not be excessive in terms of being justified but but which does overwhelm the message. Carell gives what is the film's most memorable performance, funny and getting the point about just how wrong, dangerous, and quite possibly illegal the banks' activities are across while giving the rest of the cast the chance to play things out. They're a pretty entertaining group on the whole - Christian Bale as the eccentric investor who combines instinct and willingness to crunch data, Ryan Gosling as the broker who sees opportunity in others' complacency, John Magaro & Finn Wittrock as young contrarian investors (with Brad Pitt as their mentor) - and McKay's use of fourth-wall-breaking guest starts to explain the tricky concepts frees the main cast up to give performances that seldom need to get derailed for exposition. Perhaps the most clever part of the movie is how it gets kind of suspenseful toward the end as their predictions that the sub-prime mortgages that the house of cards is built upon start to collapse. Most people buying a ticket for this movie know how is going to end, so the question becomes less if the collapse can be avoided than if the guys who have figured out a way to bet against it will be paid, and that's not necessarily a question of right or wrong, but of whether or not these guys have been clever enough. Just by getting excited about this, the audience becomes a bit complicit - yes, we're rooting for them in large part because the cast has charmed us, but we're also demonstrating the same amorality they are, treating the system as a game or a puzzle rather than something with real consequences. There are moments when we're reminded of right and wrong, but McKay seems to deliberately undercut them, both because there's no happy ending on those grounds and because we probably don't deserve to be let off the hook that way. Because of this, it's maybe not so viscerally satisfying as the more understated Spotlight is, which is an intriguing paradox to consider when the time comes to hand out awards. A little reflection reveals it to be an especially intriguing combination of entertaining and complex, which is a very pleasant surprise. I've been listening to the soundtrack album to this one a fair amount over the past couple of days, as I knew would happen from the first time I heard the overture while the curtains were still down. It's one with plentiful dialogue excerpts, an issue when you're using it as background music and suddenly have to worry if your neighbors are going to take all the uses of a certain word beginning with the letter N out of context, but also because it means I've heard a certain speech delivered by Tim Roth a lot and been removed that, for as much as it lays out a great deal of what filmmaker Quentin Tarantino wants to talk about, there's reason to question why this character oops to make it other than pure showmanship. Given that this is a Tarantino movie, that's probably a completely fitting reason. This is, perhaps, his most heartfelt movie; he wants us to look at the way racism works as the very presence of Samuel L. Jackson's bounty hunter Marquis Warren is an easy way for other characters to show their worst sides, with uncomfortable truths coming to the fore even in regards to those treating him with apparent respect. He's clearly worried about a justice system that displays many of the same flaws apparent in the film's setting (Wyoming about ten years after the Civil War). But, for all that he spends the first half of the film letting this play out with barbed words, the intermission and what comes after can't help but remind us that taking movies apart, seeing how they work, and putting them back together may always be at the top of his list of interests. Right away, he's getting cute with how stuff happened during the fifteen minutes we were emptying or bladders and telling our sodas, and almost impishly telling the story by focusing the camera. Then it becomes a peculiar combination of Agatha Christie mystery and bloody violence, barreling the story forward, but still giving the cast room to show how all the stuff they were working out in the beginning is motivating things, even as Tarantino jumps back in time and remind the audience that, oh yeah, that guy was in the opening credits. It's also a terrific cast - with any luck, this could be the role that wins Samuel L. Jackson an Oscar, because he's absolutely terrific, the smartest guy in the room and in most cases and always the most interesting, fully aware how careful one needs to be as a black man in this day and age but always wanting to show off, and often able to make it work. Then there's Kurt Russell, demonstrating that the Western is perhaps his natural environment as a blustery bounty hunter, Jennifer Jason Lee often seeming to fade into the background only to come roaring forward as the most vicious member of the group and perhaps the most dangerous despite spending most of the movie in handcuffs. And I'd call Walton Goggins's performance star-making, but after the full run of Justified, I have a little trouble accepting that he's not a huge deal to the public at large already. His character is certainly the one worth talking about after the end, just in terms of what he became. There's plenty of mention up top about how gorgeous the 70mm print looked, but it's worth mentioning that it wouldn't be quite so amazing without fantastic cinematography by Robert Richardson: For all that this movie is mostly stuck inside the a single building, which instinctively seems like a waste of the big camera, it's still stunning, perfectly composed and because of the clarity of the picture, it's almost like a 3D movie where the screen defines the front pane of a box. The soundtrack by legendary composer Ennio Morricone is fantastic as expected, and both the chewy dialogue and creatively nasty bloodshed are a ton of fun. It's one of Tarantino's smartest and best movies, and absolutely worth catching in all the millimeters at least a couple of times. 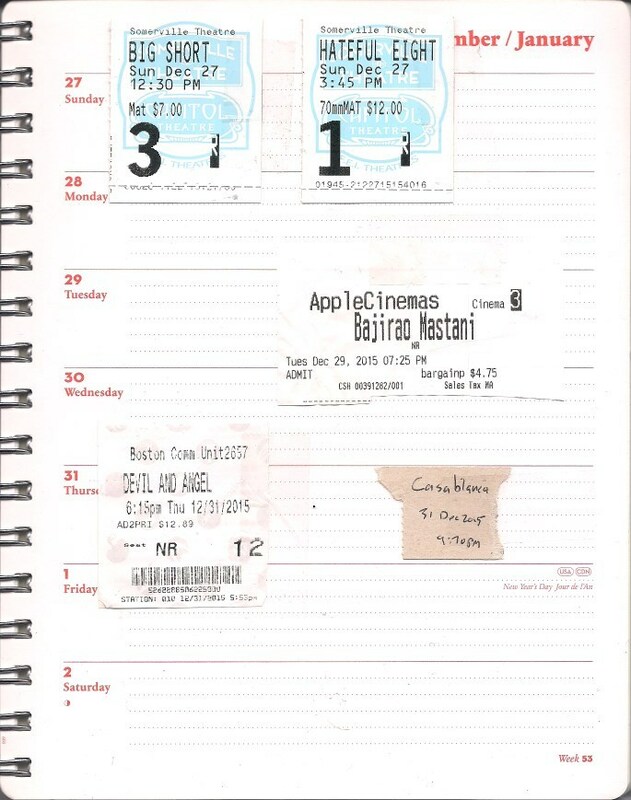 The most recent instance of me writing about Casablanca on this is about ten years ago, which seems too long, but considering that it mostly pops up at the Brattle for Valentine's Day, when I'm at the sci-fi festival and the Brattle is filled up because it's an Event. I'm reasonably sure it hasn't actually been ten years, because it shouldn't. Because this thing is, still, basically perfect. The only real argument against it is that the "letters of transit" are a basically ridiculous plot device (and, okay, Ilsa referring to Dooley Wilson as "the boy at the piano"), but otherwise, it's a perfectly delightful couple hours, romantic while being too sappy. It's funny, zips forward with little pause between classic moments that never seems like it's just moments put together. It really should be seen on a regular basis. I kind of wish I had the strength to give up on Sherlock after this, because it's just kind of frustrating to see what started out as an exciting look at how Sherlock Holmes and John Watson transfer into modern times has seemed to lose track of what actually made it appealing. Indeed, this seems to take the problems of the third series - the inclination to spend the whole time talking about the relationship between Holmes & Watson rather than letting it reveal itself through how the pair solve crimes. This takes it a step further, getting into self-examination of this particular version. and being way too cutesy about how the techniques used to make the characters modern translates to the nineteenth century. But, dang, how do you drop Benedict Cumberbatch and Martin Freeman, with scripts by Mark Gatiss and Steven Moffat that have as much energy as anything on television, and the re-translation back to the 1890s is beautiful and has what could be a pretty darn good mystery if things didn't completely unravel because the people making it didn't think the mystery portion that serves as this sort of story's backbone. There's certainly some excitement as it goes on. It still feels like a great opportunity wasted, though, and I groaned once Moriarty showed up. The character's a crutch in most takes on the series, but he's grown completely out of hand her, and what was an exciting take on the character in 2010 is now the villain who just won't go away, no matter how dead he may be.